Bought a flat screen TV and proudly wall mounted it only to have to deal with trailing wires to your DVD player and set top box? Make yourself a small floating wall mounted Shaker style wooden cabinet to take your DVD player and set top box and hide the wires behind a white board centered below your flat screen TV. Sounds complicated? Not a bit of it! Take your Dremel® DSM20 Compact Saw and simply follow our step-by-step guide below! Measure your DVD player and set top box to decide on the dimensions for the cabinet. Mark where it will go on the wall – centered, for example, allowing for a gap to get to any controls on the underside of the flat TV screen and for the wires. Measure the gap at the bottom of the TV screen where the wires need to be hidden by your white board, above the wooden cabinet. Mark up and cut all of the lengths of wood using the Dremel DSM20 compact saw, the Dremel DSM500 Multi-Purpose Cut-Off Wheel and the Dremel DSM Edge Guide as per our cutting guide above. Then rout the front and side edge details onto the top of the cabinet using your Dremel 3000, Dremel Plunge Router Attachment 335 and the router bit 615. Using your Dremel Glue Gun and Dremel 7mm Wood Glue Sticks GG03, glue and pin the back of the cabinet to the two sides, and then glue and pin the top and base to the back and sides. Leave to dry. Cut the ten lengths of 36 x 4mm pine strip wood for horizontal and vertical door details using your Dremel DSM20, with Multi-Purpose Cut-Off Wheel with the Dremel DSM840 Cutting Guide. Glue and pin the strips of wood using your Dremel Glue Gun and Dremel 7mm Wood Glue Sticks GG03 as before, onto the fronts of each door to create the Shaker effect. 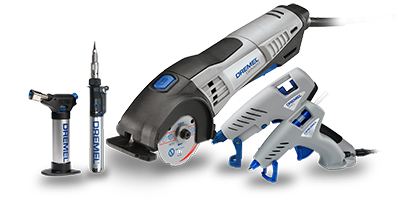 Choose where you want the hinges and rebate the cupboard and doors for each of them using your Dremel 3000 with Dremel Plunge Router Attachment and router bits 654 and 650. Fit the doors to the cabinet with the hinges, and the screws that came with the hinges, using a manual screwdriver or powered driver and a suitable bit. Cut the shelf using your Dremel DSM20 and Multi-Purpose Cut-Off Wheel to the size in our cutting list. Then, fit the shelf inside the cabinet. Make two wooden shelf brackets from the strips of wood you cut earlier. Cut the shelf supports from the 36 x 4mm pine strip wood, as per our cutting list. To fit the shelf supports inside the cabinet, glue and pin at a height of 19.1cm from the base. Leave to dry before inserting the shelf. Then, fit the shelf inside the cabinet. Fill all end grains with wood filler and sand off any excess using the Dremel 3000 and EZ SpeedClic sanding discs SC411. Prime and paint to accessorise with wallpaper. Fit the door handles and mount the cabinet onto the wall at the desired height. TIP: if you don’t need a wooden cabinet for this purpose, you could still use this project step-by-step guide if you wanted to make any small cabinet e.g. for the bathroom or kitchen.